Three Mile Island, Chernobyl, and now Fukushima … what do they have in common? All three were nuclear accidents? True enough. Not what I’m looking for though. The Japanese government report on the Fukushima nuclear accident was released a few days ago. It clearly laid out the cause of the still smouldering Fukushima nuclear disaster: Human error. This is what I was looking for, in both prior nuclear accidents, human error was a huge part of the problem. This isn’t terribly surprising, in numerous industrial accidents human error was a major contributor. The Texas City Disaster. The Piper Alpha Fire. The Exxon Valdez spill. Bhopal. I could go on but I think I made my point, human error is often a major contributory factor in industrial accidents. And that’s being generous I am sure, I’ve yet to find a major industrial accident that didn’t have some component of human error. It’s not surprising. There are so any things that can go wrong with any complex system, some of them unforeseeable, that sooner or later someone is going to make a mistake or mistakes that lead to catastrophe. I don’t think this is really debatable. Even airliners, where we have spent enormous (and largely successful) efforts to make safe, still sometimes crash. It’s just now been determined that the Air France jet that flew into the Atlantic a few years ago could have recovered had the crew acted correctly. People sometimes make bad calls in a crisis, that’s not ever going to change. The point here is that no matter how well designed something is; no matter how many safeguards, alarms, and back-ups it has; sooner or later someone or someones are going to bypass them all and cause a problem. And this of course applies to nuclear power plants, which are certainly as complicated as airliners. And we now have three “crashed” nuclear power plants, and it is 100% certain it will happen again. No matter how much they learn from Fukushima, it will happen again. This is a problem. A big problem. A problem the nuclear industry and most of the world’s governments don’t want anyone to know about. It’s a problem because when an airliner crashes, a factory blows up, a ship sinks, etc., the damages are generally local and containable. 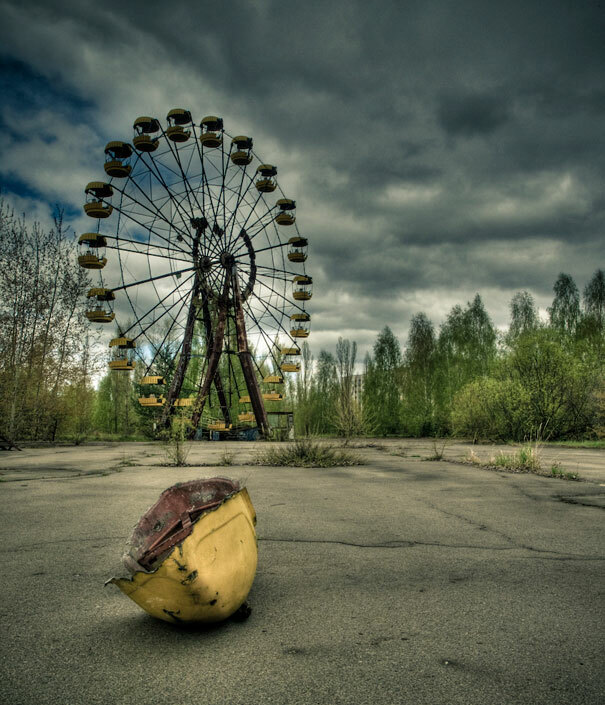 Chernobyl badly contaminated 1,000 square miles, seriously contaminated thousands more, caused problems thousands of miles away, eventually spreading fallout all over the Northern Hemisphere. There’s every reason to believe that the damage from Fukushima will be at least that extensive. This is serious damage on a global scale from a single industrial accident. When a plane crashes or a factory blows up a few hundred people are killed, but ultimately the damages are limited in geography and over time. The worst fallout (Cesium 137, Strontium 90) from a nuclear accident has a half life of 30 years, which means it might be decades or centuries before the worst contaminated areas are safe again. Which leads into the second major problem with nuclear accidents. We don’t really know how much damage they cause. Some people say Chernobyl only killed 28 people, most experts put the total at around 10,000. Some experts peg it at over 100,000. And in both of the last estimates, non-fatal cancers are estimated at about ten times the number of fatal cases. Basically one can find “expert opinion” for pretty much any level of death and cancer one wants. How do us worms know? Well, the cigarette industry had no trouble finding “expert opinion” saying cigarettes were more or less harmless for decades after the issue was settled as far as scientists were concerned. The nuclear industry is just as well funded as the cigarette industry, it’s far more difficult to do research on the topic, and it’s very easy to manipulate the data to get any result one wants. And unlike the cigarette industry, the nuclear industry has friends in big government and big military everywhere. In other words, when some government or industry spokesman claims that nuclear energy is “safe,” it should be taken with a large dose of salt. My only real point here is that the safety of the nuclear industry has been wildly exaggerated, usually by comparing apples to oranges. There isn’t any really comparable industry. What other kind of industrial installation in the worst case scenario can render everything within 15-20 miles uninhabitable for decades, and cause thousands (or tens or hundreds of thousands) of cases of cancer over an entire continent, if not an entire hemisphere? And how close is the gentle reader to the nearest nuclear power plant anyhow? « The Higg’s Boson Explained so That a Five Year Old Can Understand It. Too bad we aren’t better at using radioactive materials for energy, yes nuclear stuff is complicated, but its really just a steam engine running off hot rocks, and to me thats not a very advanced way to transfer the energy to a usefull medium. I know there are some nifty nuclear sattelites with an RTG, but they aren’t safe either, just seems like we should be able to do better than a fancy steam engine is all…. The US Navy has never had a nuclear problem, and to put Three Mile Island in the same category as Chernobyl or Fukashima shows your anti-US bias, which has been coming out more and more. How about France, or Germany? Any problems? No. I’m always bemused by your comments Mr Steve. You’re all over the map, this was a very focused post. I put TMI in the same class as the other two because it was a serious commercial (power generation) reactor accident compounded by human error. Granted the fallout release wasn’t on par with Fukushima or Chernobyl, but the point was that such an accident could indeed (and will eventually) happen in the USA … or Germany or France or Iran or anywhere that nuclear power plants are operated. Your contention that commercial nuclear power is our “only choice” does not appear to be supported by your argument. I will however make a dedicated post on the topic soon and we and whoever can debate this issue, it is a commonly stated argument in favour of nuclear power generation. Military applications of nuclear power, well, I dispute your contention, but that too can wait until a future post. And lastly, your contention that I am “anti-American.” If by that you mean I am critical of the direction our government has been headed since WW2, especially since 1980, then I’m proud to be anti-American. I don’t consider it anti-American though, I consider it to be patriotism. It’s the Republicans and Democrats (with exceptions on both sides of the aisle) that are selling us out. Name me any industry that gets to dump the cost of its failures on the citizens of the world! Don’t tell me that notion fits in to real capitalism.. its truly a heads I win, tails you loose scenario. Only a sociopath could believe in that kind of public guarantee for their ‘great idea’ of nuclear power. It is certainly NOT a capitalistic at all. No, in that case Im as Patriotic as you are. We’ve been moving in a bad direction since the Wilson Admi istration substituted the word Democracy for Republic in the military training manuals just prior to our entry into WW1. Since then, we have been going down a slippery slope moving farther and farther away from the country originally founded. Altruism, socialism, redistribution of wealth, intrusion of government into every aspect of our lives, nanny state mentality, and the strange notion that we are policeman to the world. So maybe I was wrong. What I Should have said is that you speak as though you are an authority on these subjects, and having wikipedia in your bookmarks does not necessarily make it so. You speak only critically with little regard for what happens in real life. I agree with you more than you think but have a lemming-like obsession with being a devils advocate. I do enjoy this blog and have for– how long? Im pretty sure the US Air Force screwed up with ‘nuclear powered aircraft’ so thats why I specifically said US Navy… Good call w theArny though. One might argue that Bhopal was more devastating than Three-Mile Island and possibly even than Chernobyl. Depending on how you define “damaging” one might argue that an oil spill similar to the Valdez or the Horizon in the Gulf of Mexico devastates a huge swath of the planet, and because of ocean currents can have impacts VERY far away from the initial source, both on humans as well as their environment and food sources. I agree that the nuclear industry has a vested interest in downplaying the dangers, but equally, opponents have a vested interest in making those dangers seem greater than they actually are. In short, we have little reason to believe ANYONE with a “dog in the fight.” However, there is a certain amount of data on the global impact of nuclear pollution … from US and Russian nuclear weapons testing in the 50’s and 60’s. Between atmospheric tests, above ground tests, water tests, and underground tests, the nature of radiation spread through various kinds of exposure has been fairly well documented. While we don’t actually SEE a lot of that data specifically, we can see that despite all the testing done in the 50’s and 60’s, now, 5 decades or so later the globe is still here. Will Fukishima cause problems globally? No doubt it will. But the truth is, the debris that got washed into the ocean by the tsunami, and is now washing ashore around the globe, is at LEAST as a damaging to the environment as anything we’ve seen from radiation. I do think we need to worry, somewhat, about Fukishima and the future, but I also don’t think it’s the biggest concern we have. All forms of power generation have their potential problems, and while nuclear does have significant issues when there are serious problems, it’s worth remembering that, under “normal operations” nuclear power is FAR less “dirty” than any other form of power (except wind or solar arguably, neither of which generates near enough total power to power our society). The choice seems to be between serious pollution problems at all times in the case of coal or petroleum, destruction of vast swaths of wilderness for hydro before any megawatts are ever generated, or nuclear plants that produce virtually NO pollution during normal operations but which have a small chance of failing and thereby causing serious pollution. A very famous naturalist wrote:A patriot must always be ready to defend his country against his government. The sad truth is most people, you included, have no real knowledge about ‘radiation’.. and make senseless comparisons between apples and artichokes. When a Chernobyl or Fukushima happens, people like you think it must be OK because the disaster is invisible. Your so wrong there is no point in trying to educate you. Okay radiation in a hundred words or less— There are two types of radiation; the type emitted by the sun and just about everything else (non-ionizing) which comprises ultraviolet, microwave, radio waves,infrared, visible light, etc. While non-ionizing radiation can be very powerful it does not have the ability to change atomic structure. Ionizing radiation is the ‘radio-active’ stuff that scares everyone (some of the snow you see on an analog tv or static you hear on a radio is ‘cosmic backround radiation’ the leftover from the “Big Bang”, but thats another story) It comprises of Alpha particles, Beta particles, Gamma rays, x-rays, and neutron particles. Simply put, ionizing radiation changes the configuration of atoms, and is very damaging to DNA. This can cause genetic mutations, cancer, etc. The higher the level of ionizing radiation, the more damage to DNA, up to the point of radiation sickness and death. ..Three Mile Island, Chernobyl, and now Fukushima … what do they have in common?.. Sure nuclear is a bit of a can or worms, but the hard truth is that when comparing it to carbon nuclear is the safest (or least dangerous if you like) option. Carbon is in the process of causing the sixth mass extinction. We either a) continue with carbon and let that happen, b) turn the capitalist system on its head overnight, ending consumerism, or c) we go nuclear as a matter of urgency, changing to clean renewable wave and wind or whatever power gradually over the coming century as that kind of technology improves to meet world demand, as at the moment all the windmills in the world don’t provide anywhere near enough energy. The world is adding a billion more people every twelve or so years, and with poorer countries rapidly developing we simply have no choice but to go nuclear as a matter of urgency and run the risk of accidents happening and a small percentage of us getting cancers we wouldn’t otherwise have got. If we don’t take that course of action then the planet will burn taking the vast majority of life with it, because as much as I would like it to, the capitalist system sure isn’t ending just yet.